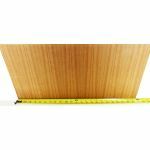 Two Square Feet (12" x 24") Teak Veneer Panels -- 2 sq. ft. 1/8" & 1/4" thick panels have teak veneer on one side only; 1/2" & 3/4" thick panels are veneered on both sides. 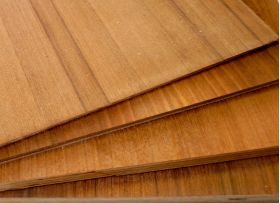 Plywood substrate is exterior grade. Accurately cut. Very well packed w/ extra cardboard on the face (back side could be used as face). Shipped & rcv'd quickly. 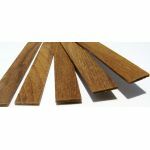 Excellent material, no voids, no patches, full-length grain and sanded both sides. Packed in bubble wrap and cardboard. Thanks, guys! Did not deliver one of the pieces needed, and was not square, otherwise good. WE have a Scandinavian wall unit in which we cut a hole to accommodate a TV set a long time ago. This left an ugly hole behind the new flat screen. You furnished an appropriate piece of teak plywood (with the grain in the right direction) when matched beautifully when oiled. Price was reasonable and delivery was prompt. Thank you.